It’s a cold dismal January here in the South End, dry with a lot less snow than last year. 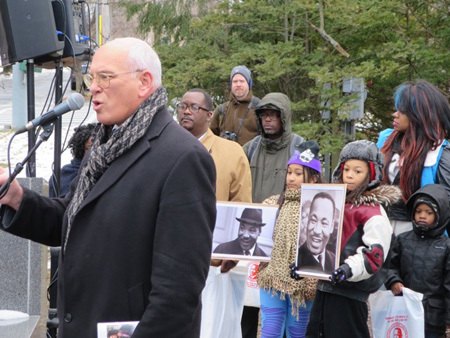 This Martin Luther King Day morning it was relatively warm, the temperature a hair above freezing. Once again I went out of my house in plenty of time to meet the marchers on their way to my neighborhood, but I underestimated that icy wind and had to keep my hands in my pockets, wishing I’d brought my gloves. 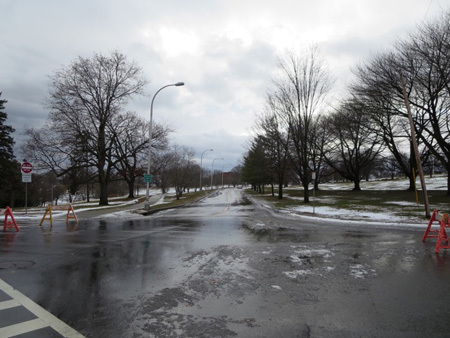 Actually I’d gone out an hour earlier at 10 AM to throw salt on the Morton Avenue sidewalk across the street from our Martin Luther King statue, the street is a slope that sits in shade and it was still sheer ice from the night before. 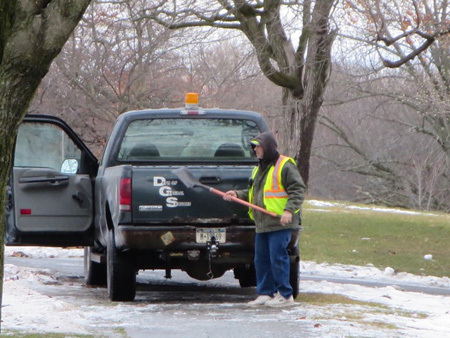 On the Friday before the weekend I noticed a City crew clearing the snow and ice from around Martin’s memorial. Today on Monday I saw that the City had sent exactly one guy to scrape new ice from around the statue, he labored steadily. Okay, is everybody bored with this post already? 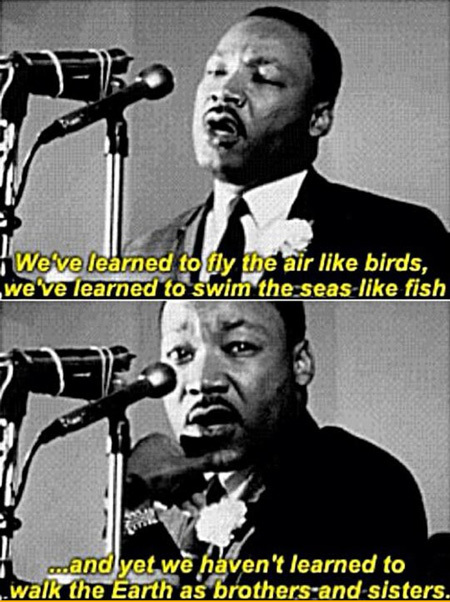 The same old MLK Day post that I write every year? Well, I’m always fascinated that every single year a procession led by our leading local politicians, accompanied by various police in dress uniforms and of course the corporate media content providers all converge on my neighborhood. My neighborhood. Boy, that makes me feel like I live somewhere important. Actually, one of the big reasons why I come out here to observe and photograph the procession and the speeches and The People singing and carrying signs is because I want everyone involved to know that someone in this neighborhood cares very much that the official New York State MLK Day observances terminate right here. That’s not the only reason, another is that I want a permanent online record of these visits to my neighborhood. Another is that hey, I like this chance to meet the elected and appointed authorities in my very own neighborhood, albeit briefly. 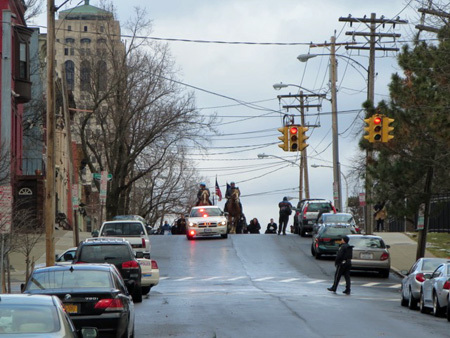 While waiting for the marchers and enduring the cold breeze, I had a grim laugh watching cars pull up to the corner of Park Avenue and MLK Boulevard (which is what we call South Swan Street in the park.) The stop sign at this corner, you see, is set back about 20 feet or so from the actual spot where a car has to stop before safely proceeding into the intersection, which is at least ten feet past the crosswalk. This is because cars that park on MLK Boulevard block the view, only a crazy person would stop at the sign and then pull into the intersection without stopping. About a month ago, I pulled up to this intersection in my truck, came to a complete stop, looked carefully, and then proceeded onto MLK Boulevard, only to be quickly pulled over by a cop. 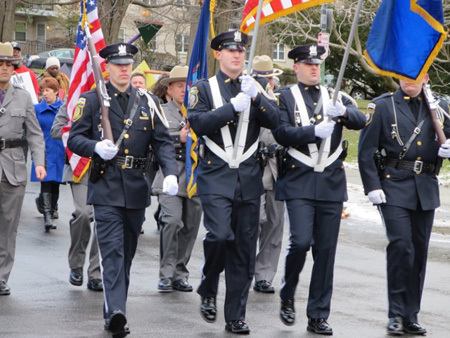 He was a rather short fresh-faced boy in a State Trooper uniform, obviously one of the Capital Cops who patrol the State buildings and for some reason have jurisdiction in the rest of the City. I told him quite honestly that I didn’t have the slightest idea why he had stopped me. Standing next to my truck window, the boy was smiling so happily he looked like he might burst out giggling. He told me I hadn’t stopped at the intersection. I told him that I had. With enthusiasm he said, “You sailed past that stop sign at 11 miles an hour, you want to see?” Which I took to mean that the boy had been testing out some new surveillance gadget that morning and was thrilled with the results. I knew better than to argue with a cop, especially some unconfident kid carrying deadly weapons and a license to kill. Especially a kid who looked proud of himself for pulling a fast one. I decided later that day to make a major issue out of this. Within a few days I had a righteous blog essay written in my head, I was going take this to the Court Of Public Opinion and loudly irritate certain public officials. Yeah, yeah, I know, I passed the written driving test when I was 16 years old, I know that the driver is supposed to stop twice, once at the stop sign and again where he has to stop. But who the hell does that? The cops certainly don’t do that. This was a technical violation that has nothing to do with safety, and I was ready to fight and expose what looked to me like an obvious Revenue Trap. But a week later I got a letter in the mail from the City saying my “moving violation” was dismissed. It turns out the kid made a big mistake on the official violation form, he had scheduled my court date for this very MLK Day when the City courts are closed. Apparently that’s an automatic dismissal. 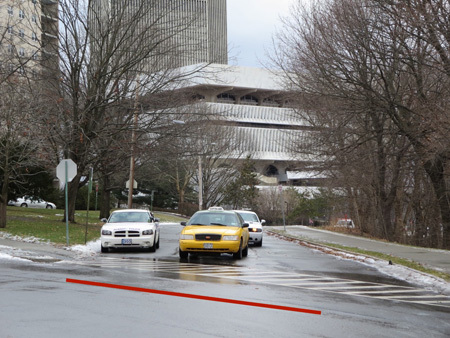 So on MLK Day, at the exact time when I was supposed to be sitting in court, I stood here at this same corner watching one car after another “sail past” the stop sign. But the Albany police officer sitting in his car did not seem in the least bit concerned since every driver stopped where they needed to. So much for my criminal career. Which, standing on this corner, made me think of recent events in Ferguson, Missouri, where unarmed mobs of protestors confronted edgy cops riding military-issue battle wagons and brandishing the same heavy weaponry and body armor used to kill women and children in war zones like Afghanistan and Iraq. I suppose there’s a certain bravery in fighting with cops, but what was the point? Instead, the protestors should have stuck to chasing down and hounding the elected and appointed officials, the top police brass, the local corporate media and other political authorities. I think that would have yielded better results, but what do I know. How would Dr. King have handled the Ferguson crisis? 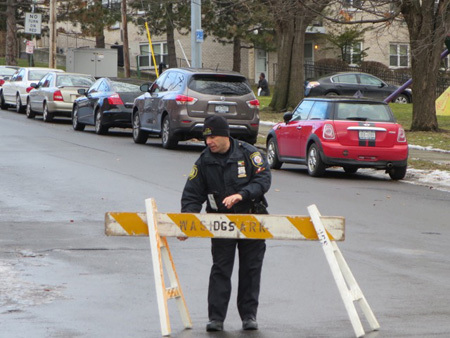 When it was almost time for the marchers to appear, the Albany police officer that I waited with moved the barriers off South Swan Street, and instead used them to block Park Avenue. He told me that at almost the last minute he had gotten a call that the route had been changed for mysterious reasons. Sure enough, in a few minutes the procession appeared at the crest of the hill on South Swan Street and headed our way. This was the first time I’d seen them take this route, which meant that the marchers had to walk up the steep hill on Madison Avenue for a little bit. 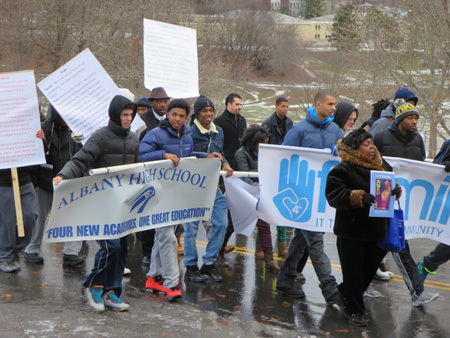 It was, as marcher Assemblyman John McDonald pointed out to me after the event, a longer walk than the usual one. But after cresting the hill it was straight down for the marchers most of the way. I don’t believe the longer and somewhat more arduous route caused any medical emergencies. 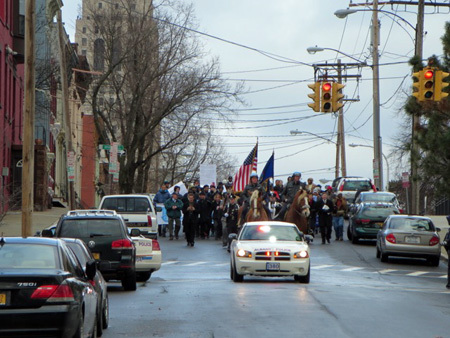 The first thing I noticed was that we had two cops on horses leading the march behind the lead police car this year. 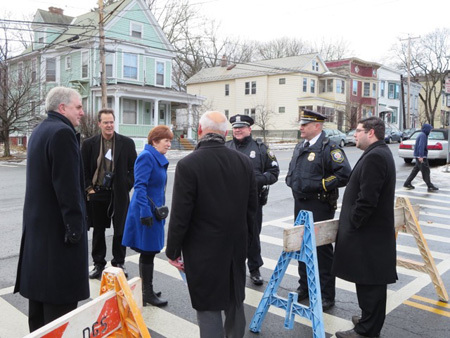 Last year, the first year of mayor Kathy Sheehan’s reign, we had only one horse, which I was told by a police sergeant reflected the mayor’s concern with cost cutting. When Jerry Jennings was mayor we always had three horses no matter how dire the City’s financial condition. Perhaps this year’s two horses reflects cautious optimism by the new administration. So the marchers came by but they were strangely silent. Most years you can hear them singing We Shall Overcome long before they get to Lincoln Park. Instead we were treated to some preacher with a megaphone who was reciting the Our Father. Several other participants tried to get him to stop doing that, and eventually he shut up. Another interesting difference from other years was that there was a very loose front line of elected officials. The former mayor always used this ceremony to show favor, if you were one of his In Crowd or a dignitary that outranked him you got to march shoulder to shoulder with him behind the color guard. That seems to have ended with Ms. Sheehan. While some of the elected and appointed officials grouped together, many were strung out all along the line of march almost to the end. One more interesting difference was that the collection of generic signs provided by the State and distributed to the marchers were missing. These signs would say things like “Equal Rights” or “Fair Housing” and were meant to be nostalgic and separate from ongoing realities. Last year I noted that the signs were getting a little tattered, and also noted that recent circumstances had started to make some of the bland messages on the signs relevant. Instead what we had this year was a proliferation of homemade signs. A lot of them had quotes from Dr. King, there were pictures of the man and as usual there were some banners identifying the groups marching together. What was mostly missing was controversial or confrontational signs and banners. The only exception I spotted was a young lady carrying a pro-union sign, controversial because, as we all know, people who work for a living deserve no consideration or bargaining power and ought to be ground underfoot by the elites. Every year I hope for some controversy, but I guess this march and ceremony is more about cooperation and solidarity than confrontation. 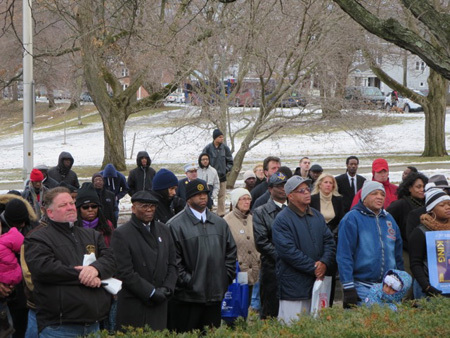 But I can’t help but wonder what Dr. King would think about this yearly ritual if he were still with us. Would he disrupt it with a counter march, would he condemn it and avoid it, or would he see value in the ritual and approve? 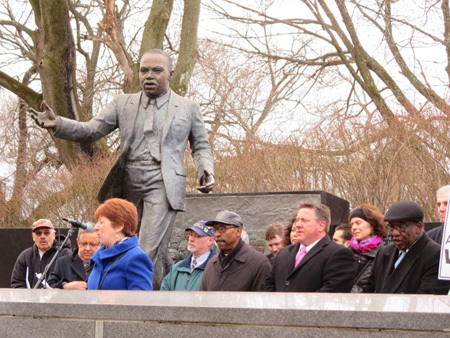 It was only as the marchers approached the statue that they finally broke into We Shall Overcome for a bit. That quickly ended as the common proles arranged themselves on the grass around the memorial. Meanwhile the politicians and other varieties of authorities crowded around the statue, while the police horses and color guard settled on the street behind the people. Mayor Sheehan has turned out to be a top notch speechmaker, and like last year she took this opportunity to deliver an oration that held her listeners spellbound. Seriously, I was fascinated by the faces of her listeners, almost no one looked away from her as she spoke. She delivered it without notes, her theme was how we live in a time of great anxiety, and that anxiety can lead to positive changes. Congressman Paul Tonko spoke after the mayor, he’s a good speechmaker himself but he’s met his match with Ms. Sheehan. His theme was more of a legislative report which revolved around social justice and opportunity. Basically he was doing what a Congressional legislator is supposed to do, report to The People what our government is up to. 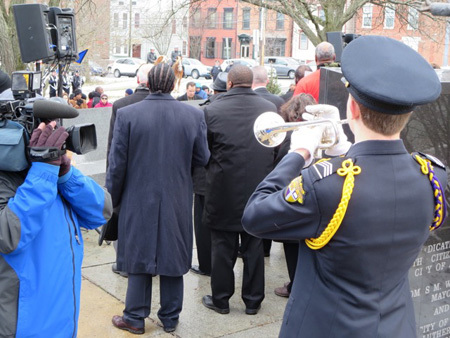 So two politicians spoke (three last year) and one reverend gave an invocation, followed by a live performance of Taps and it was over. People took their time drifting away, but as usual because of the cold they didn’t stick around too long. The politicians schmoozed a bit, the corporate media people took photos of the cute kids holding pictures of Dr. King, and that was it. As I strolled back to my house I was surprised to see the mayor and our Congressman, along with several other notables, chatting with the cops at the corner Of Morton Avenue and MLK Boulevard. Both Ms. Sheehan and Mr. Tonko looked alarmed when I approached them, considering that I publicly support both of them I find that puzzling. But what the hey. I told each in turn as I passed them that I thought their speeches were excellent, both expressed pleasure at the sentiment and looked somewhat surprised. Huh. One can only speculate what Martin Luther King would be doing if he were around today. Of course he would be incredibly old, but I don’t mean that. I mean what if he were 39 years old, in the prime of life and accomplishment like when he was murdered by persons unknown, how would he handle the events of today. The more I think about it, the more I realize the question is absurd. It has finally dawned on me that Dr. King was irrevocably a man of his times and to try to remove him from his own era and shoehorn him into ours is at best an exercise in self-deception. Do you really want to imagine him texting, or holding a cell phone next to his head while ignoring everyone around him? In 1968, when Dr. King was shot down, America was at the height of its power and had not quite begun the tailspin decline that we are all too aware of today. National politicians still made sure to consult with the voters before selling them out, corporations and Wall Street manipulators were careful to not appear too greedy, and jobs paying living wages were plentiful. Most of our national wealth was carefully regulated and recycled back into our nation, thus insuring that there would be a slow but steady rising tide of prosperity for the majority. In those days Dr. King and his collaborators demanded that the national prosperity be available to all, even to the lowest and most despised members of our society. If the 39 year old Dr. King were here with us in 2015, would that prime demand still be valid? Can we still be demanding a more fair distribution of wealth when the system has become rigged so that the worst possible parasites can siphon off our wealth and use that wealth to wage class war against the rest of us? I think it much more than an intellectual exercise to ask these questions. And yet, just as we have frozen Dr. King in time, we have frozen his program in time and not updated the demands put forth by Dr. King and those who walked with him. Asking what the man would be doing today is not a casual question, it is one that demands careful analysis and an honest assessment of the problems involved with our national decline. One thing I do know for sure. Between 1968 and 2015, if Dr. King’s life had spanned these years, he would have been pilloried and discredited by the corporate media. The nasty liars at FOX “News” and the snotty liars at NPR and all the other corporate media outfits would have hammered him relentlessly for daring to rise above his “station in life” and for insisting on the politically incorrect truth of universal equality.